We can make things simpler. 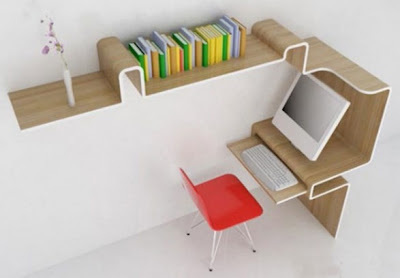 MisoSoupDesign recently makes use of this idea to design the house office desk. Precisely Speaking, it’s an office furniture set which was consist of computer desk, book shelf and table-board. The simple design of the product was represent the modern living space as the place for pleasure and business. Use the esthetic of the modern wood office desk; we can comfort ourself when we were work or fun. With the elegant line, the office furniture set is combined properly. Not only he can save our room space but also make our room more individual.